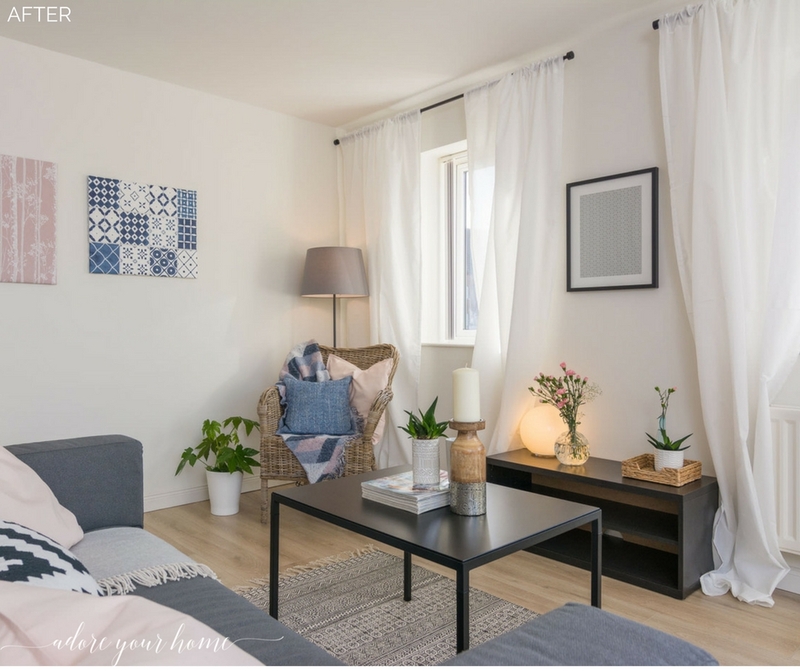 Staging your house to sell is all about you getting the BEST PRICE that your house is capable of achieving! It isn’t just about fluffy white towels and a new cushion or two. Although, you’ll often need them! You’ve decided to move for a reason, maybe to a bigger home or a better location. Or you’re downsizing to free-up some cash to enjoy life with. Your reason will be right for you, but I’m sure you haven’t taken this massive decision to uproot lightly, so let’s not take the selling process lightly either! Do not leave it to chance. Your home is the biggest thing (probably) you own and what price it sells for will ABSOLUTELY affect where you live next, what you end up living in and the lifestyle you have. How important is all that? 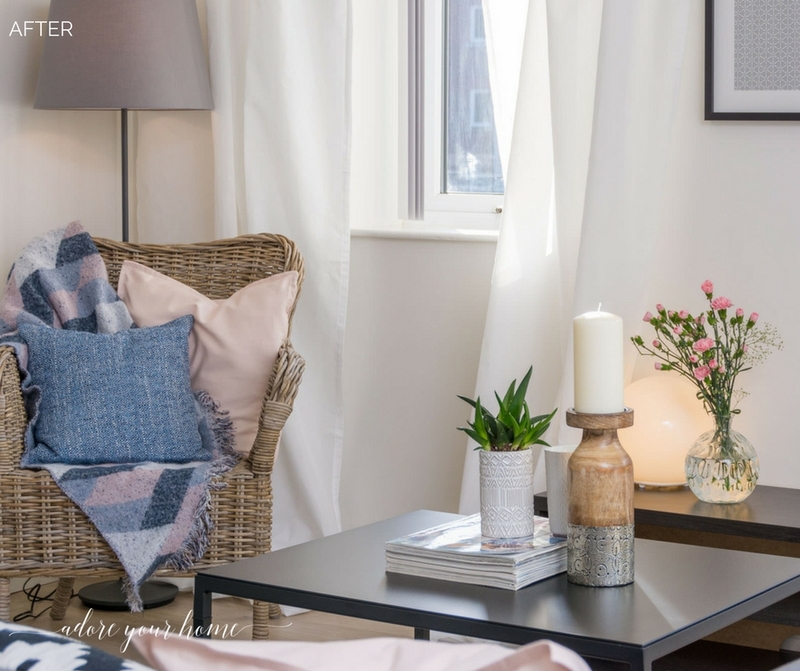 Property presentation/home staging does involve fluffing duvets and cushions and maybe buying new towels, but the reason we do these seemingly frivolous things is to get you as much money in your pocket as possible and as soon as possible. 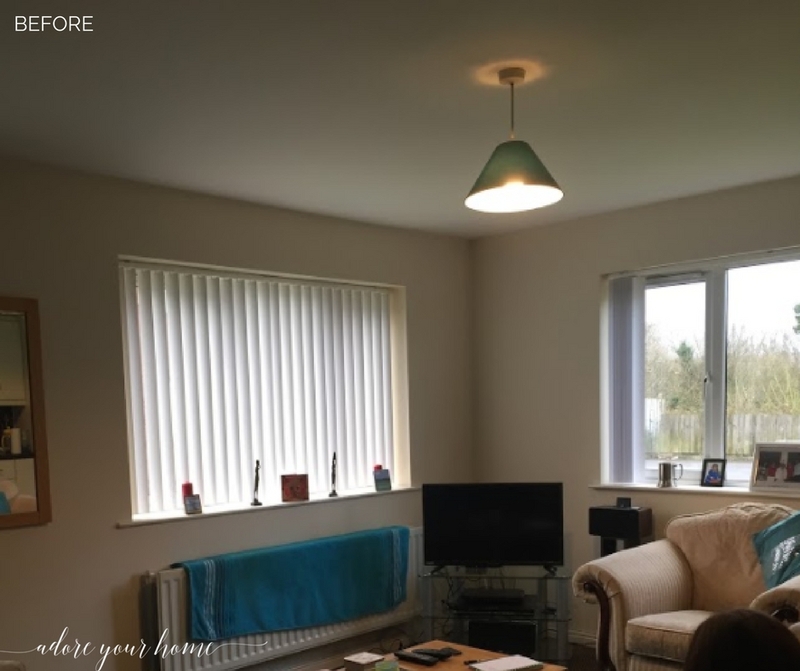 Here’s a before and after of an open plan living room to let you see the sheer power of the technique…would you buy it like this? I’d run a mile. This dingy, drab space above wouldn’t appeal to the target market, which was young professionals (or anyone, for that matter). But it might now (below)…same room, same angle, total transformation! 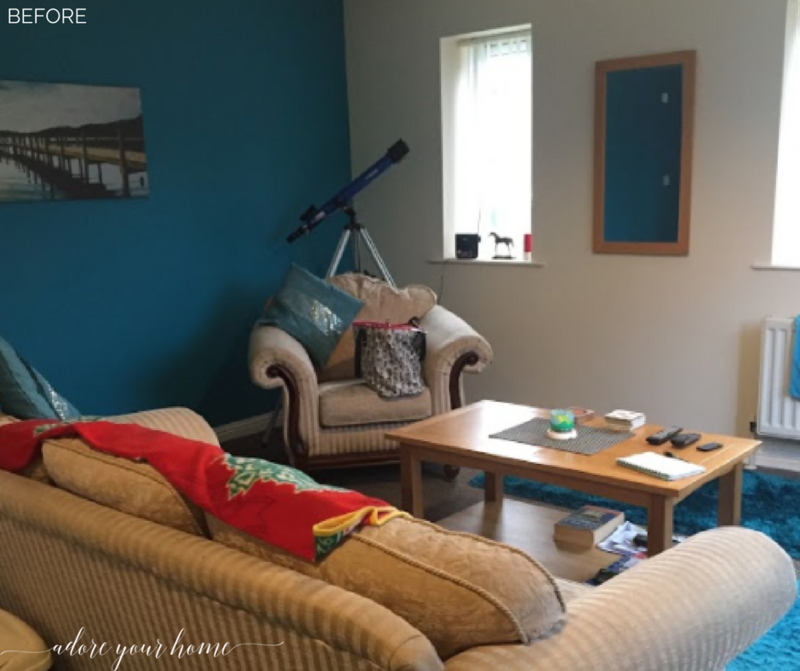 ARE THERE ANY GUARANTEES WITH HOME STAGING? No. And there aren’t guarantees with most investments. But, taking the trouble to declutter, rearrange stuff, do a bit of maintenance, clean and maybe add a lick of paint, is usually all it takes. Sometimes I meet some people who think it’s too going to be too expensive and they like how their home looks anyway, they like their decor. Well, I ask them how much do you think your first price reduction would be if it wasn’t getting offers? The usual advice from an agent when a home isn’t selling is a reduction in price. And estate agents always talk in the thousands…£10-20k, sometimes even more. DOES A PRICE DROP OF £10k+ MATTER TO YOU? The danger is, that a just slapping on a price reduction doesn’t ‘feel’ real because you’re not writing a cheque there and then. But, it’s very real. And what about this interesting fact…recent research by Which? Magazine in 2016 found that properties that had been reduced by more than 5% took an average of 64 days longer to sell and had an average final sale price of almost £20,000 less than properties that sold without such a significant reduction of the asking price. That’s why I never advise people to put it on the market and just ‘see what happens’. 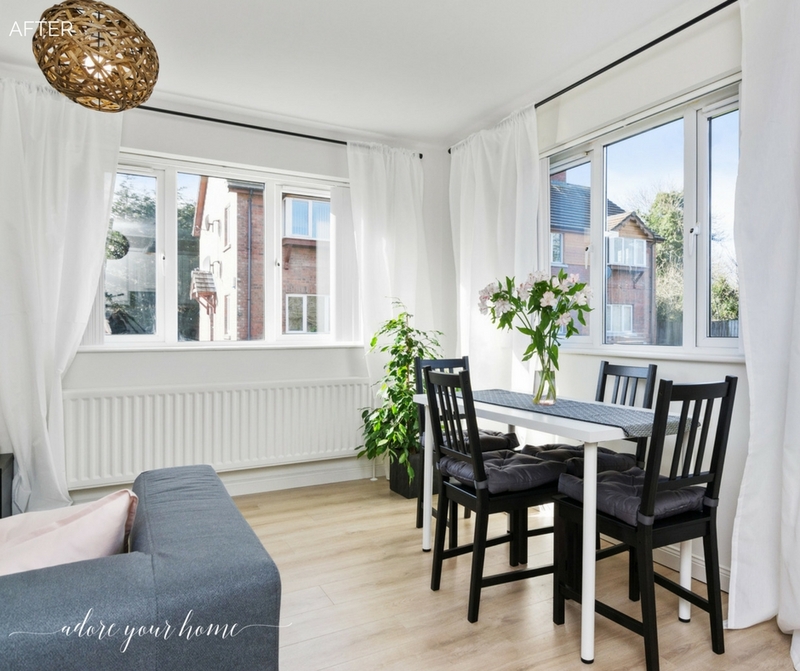 When you think about the cost to prepare your home, here’s what my strategy would be: decluttering, cleaning, maintenance, maybe a spot of repainting and probably adding some accessories are the main things. And much of that will cost you nothing but your own time. And your decor? Liking it is fine, but now you need to make sure your potential buyers will love it too. So, why not give it the best chance possible for attracting better offers and making YOU more money? I have personally seen the dramatic difference it can make in price and in length of time on the market, many times. And it can absolutely work for you too. 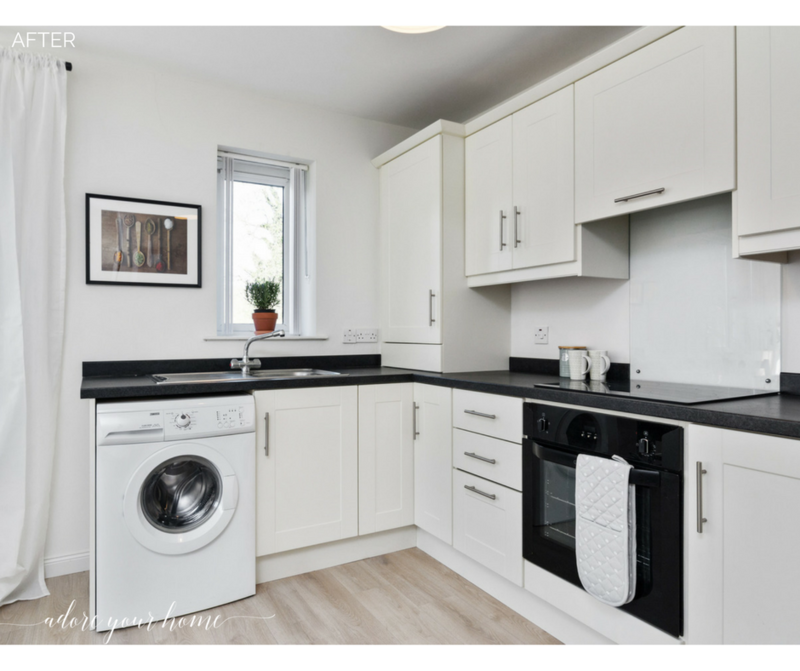 JUST LOOK AT THE DIFFERENCE IN THE KITCHEN AREA OF THIS APARTMENT I STAGED FOR SALE! This is the kitchen end of the same open plan room, it had no table to eat at. This table below is from Ikea’s desk range…the table top was around £13, the legs were £3ish each and the chairs were from their basic range. Here’s a close up of the kitchen, before, with dated tiles. Here’s a close up of the kitchen (below) after, with the splash-back dated tiles removed and a new up-stand for a cleaner more contemporary look! Having somewhere to eat at is really important, so this area was laid out as a dining area. And just look at how harsh those vertical blinds are making the space feel. Now, there is somewhere to eat and even entertain in! 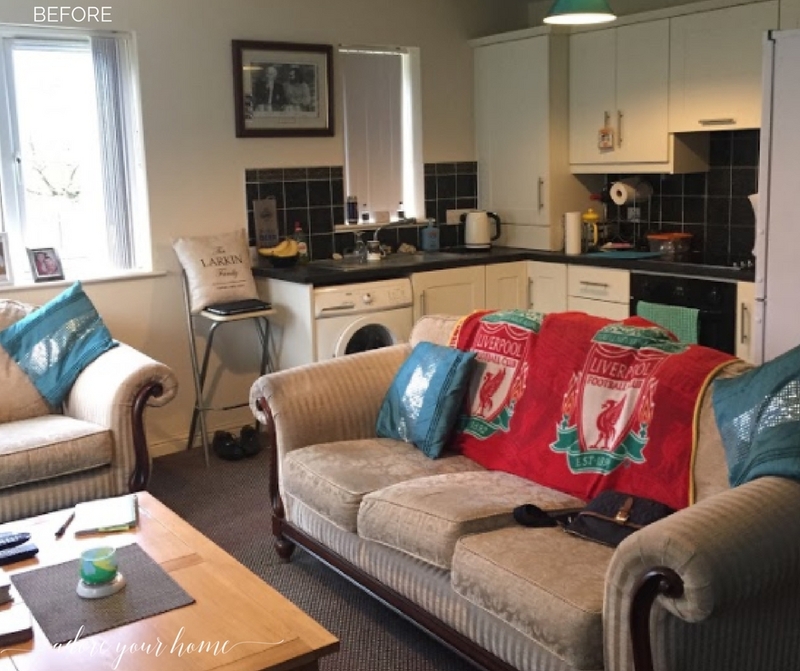 I wanted to show you how small changes can really make a house more up to date. Being more move-in-ready is critical…I was chatting with an agent of the actual property, who said just that. She said people are increasingly fussy and aren’t willing (or able) to look past horrible carpets or dated dirty kitchens…just like this apartment, I worked on. 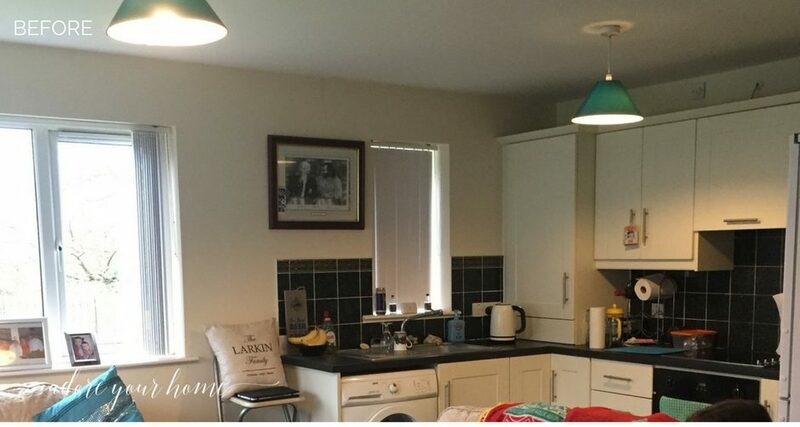 RESULT: More modern and made the kitchen look like new, even though it wasn’t. 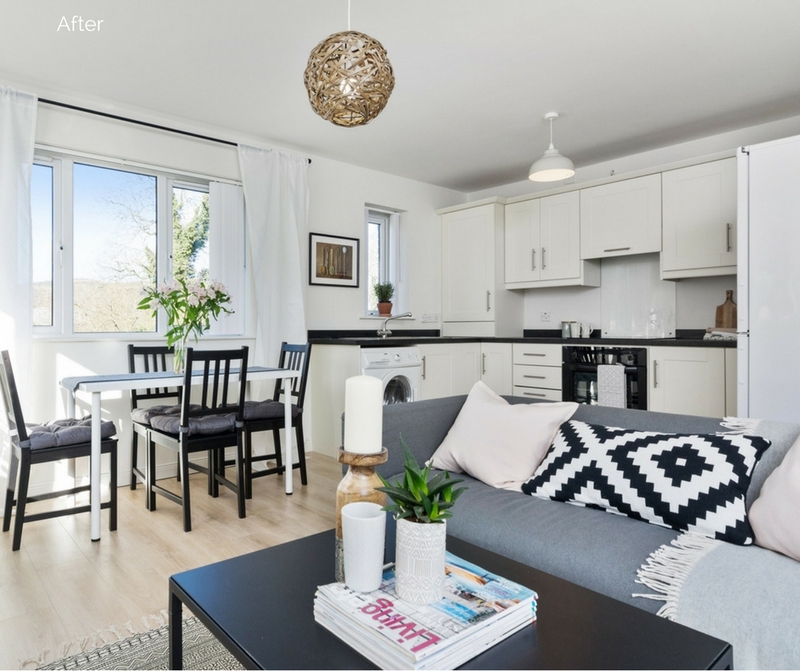 RESULT: Appeals far more to the young professional buyer and takes up far less space, making the room appear more spacious…critically important! And added simple stylish accessories including a pile of my old magazines and two wall canvases which I covered in a free sample of wallpaper – can you spot the navy tiled picture and the pink tree effect one?! RESULT: A style injection!So, the spend was minimal, but the impact was massive! 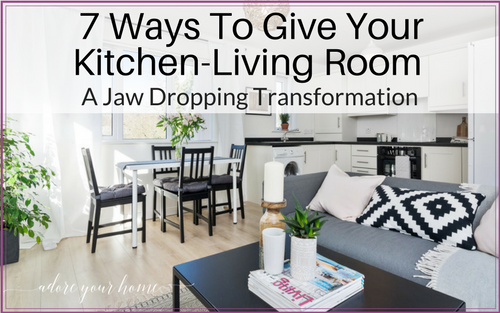 It looked like a new modern contemporary kitchen / dining / living space now, which is far more attractive to the younger market it’s aimed at. FREE STAGING GUIDE TO GET YOU MOVING! 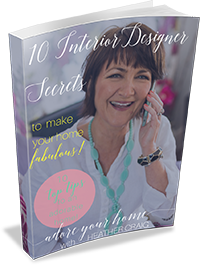 ON-LINE 30 DAY HOME STAGING COURSE! 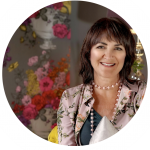 If you would like to find out how you can make those extra thousands and get your house sold for more, I run an online 30-day course which is a really inexpensive way of finding out how to stage your house with my help. Click HERE to find out more about that.